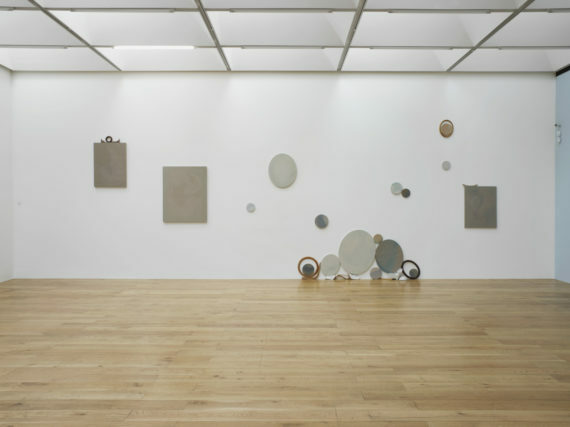 Best known for her abstract paintings, Russian-born artist Yelena Popova's current solo show at Nottingham Contemporary in her home town is split across two spaces and includes a computer-coded video projection. Anneka French discovers more about her relationship with paint, digital imagery and collaborative working. 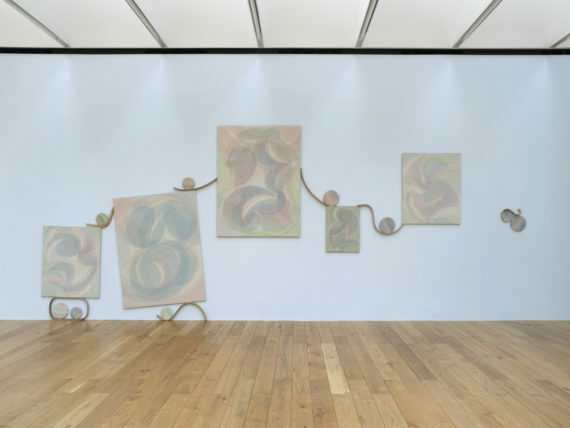 Best known for her abstract, sometimes barely-there paintings, Russian-born Yelena Popova‘s exhibition, ‘After Image’, recently opened at Nottingham Contemporary – her first solo show in a British public gallery. After studying at the Moscow Art Theatre School, Popova completed her MA in Painting at the Royal College of Art in 2011. Based in Nottingham, her work has been exhibited in Stockholm, San Francisco, Basel, Vienna and New York, with solo shows at Figge von Rosen Gallery (now Philipp von Rosen) in Cologne, and Zabludowicz Collection and Paradise Row in London. Her work is held in the Arts Council and Saatchi collections, among others. ‘After Image’ is spread across two spaces at Nottingham Contemporary. 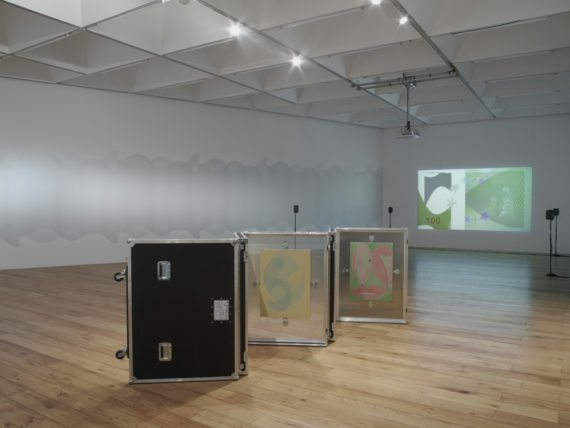 It comprises a room-sized installation of abstract paintings on linen titled Public Gallery (2016), while the other space contains a large-scale computer-coded video projection with an audio soundtrack, This Certifies That (2016), displayed alongside smaller paintings. Popova’s work negotiates ideas of abstraction, production, reproduction and consumption. Could we start with the exhibition title, ‘After Image’? 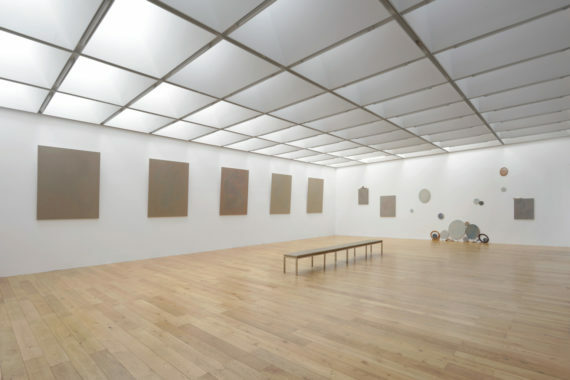 It brings the two galleries together – the paintings in one gallery from which the image withdraws or disappears and the other where code generates 30 images per second in an over-production of images. I’m interested in our image-saturated world. The title also refers to the optical illusion of the afterimage – at looking at bright light and then looking back. The two rooms seem like quite different displays. Why do you think they are different? I’m more familiar with your paintings. I haven’t seen video work like this from you before. It was a surprise. I’m glad it was a surprise. I’ve always made video in parallel to the paintings. Videos are crucial because they ask the same questions as the paintings but at different levels. This Certifies That is quite a different approach to the documentary-style videos I’ve made before but the thinking processes across my work are similar. The images in This Certifies That are generated using code. I started researching banknotes last summer. They are images replicated on a vast scale that hold their value; represent value. Marxist theories of capital and production are keystones of the work. At the same time I was looking at forgery and Leon Warnerke, a Polish engineer and activist from the 19th century. He escaped to England with a false identity, set up a photographic studio, joined the Royal Photographic Society and invented an early form of instant photography. He was also an excellent forger of Russian banknotes – his skills and inventions fed his political views. But the timing of the show in relation to the EU referendum was coincidental? Yes. The referendum has given the work political urgency but a year ago it wasn’t planned as such. 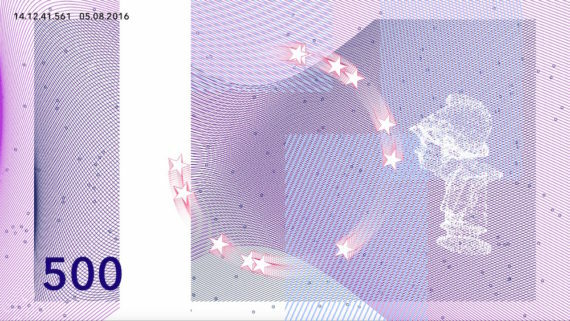 I worked with Noel Murphy to create a storyboard translated into mathematics and with Rebecca Lee to make sound influenced by Cornelius Cardew’s Scratch Orchestra of the 1960s and ’70s, where a composition becomes a set of rules. We created layers in the score that are performed by machine – the Mac makes choices. Sound and image are not repeated or looped but performed endlessly. Could you tell me more about the materials within Public Gallery? My water-based paint is composed from my own recipes. It’s important to control my materials and the look of the work. I want certain qualities such as transparency. The linens are traditional and visually appealing but very difficult to work with because every part of it is different. The chain (used within Evaporating Paintings in Public Gallery) is an historical reference. Paintings high up were chained and leant forward in academic salons. Their size is public – closely connected to those of old master paintings. Size, height and hang have all been questioned. 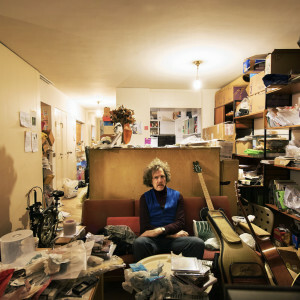 What can hold the space? What can create a dance around the larger paintings? To give an overview of the practice it was important to include some of the paintings I’m best known for. These look at how painting functions, at its collecting and display. The discussion is around painting rather than making an image. How does the digital impact upon your paintings? In the digital world we can access any image online before we go to the museum. We know what’s there in one click. If painting is not its own image, what is left when you remove the image from the painting? What is there to see between an image and an object? And the consumption of those? Consumption is a huge part of this. How much are we prepared to look for things when we are so used to the instant accessibility of images? What happens if an effort is required to see something? Do you think your work answers any of those questions? I don’t think an artwork should answer questions. They should ask questions or make a proposition. You’ve lived in Nottingham for a while. What does this exhibition in your city mean? For eight years; even when I was at the Royal College I was based in Nottingham. London is exhausting. This is the biggest show I’ve had in terms of the size of the galleries so it has been quite daunting. I have so many friends and colleagues here who will see the exhibition and judge it. But I’ve had so much support and the opening was the best I’ve ever had. You’ve been selected to feature in Phaidon’s Vitamin P3, launching in October. That will open up new audiences for your work. I hope so. Being in this text book is really exciting. I remember studying the previous ones quite carefully during my MA. In October I am relocating to Cambridge for nine months to be artist in residence at Girton College. I’m excited about the change of scene and the academic environment. There are some scientific experiments that I’ve already starting working on around the invisibility and temporality of painting.